It is indeed a tight balancing act when a worship leader who serves their church community successfully crosses over into a recording and touring artist. In a distinguished field of female worship leaders who have juggled their church responsibilities and toured internationally, including Shirley Caesar, CeCe Winans and Kim Burrell, a seasoned talent who has ministered with Pastor William Murphy should be strongly considered among this rank. In 2006, several years after she started leading worship at the dReam Center Church in Atlanta, Georgia, Tasha Cobbs eventually introduced herself as a recording artist with a self-released project. But the song that broke the gospel music mold for Cobbs in an incredibly charismatic way was the explosive 2012 hit, “Break Every Chain,” written and originally recorded by independent worship leader, Will Reagan. This plea to release the shackles burdening people’s lives was one of several gems off of her major label debut, Grace, the launching pad for her national recording platform; all while still balancing the responsibilities at her local church. The Motown Gospel release produced by worship veteran Vashawn Mitchell, captured a Grammy and several Dove and Stellar Awards and placed number 61 on the Billboard 200 Charts for Cobbs on the strength of “Break Every Chain,” “For Your Glory” and a few songs off her independent debut. Understandably, the expectations were raised for a promising new gospel music messenger, who extends her passion through the global worship mentorship program, iLead Escape. Though “Break Every Chain” still registers heavily on the gospel radio Richter scale, Cobbs now follows up her 2013 breakthrough with One Place Live, again under the guidance of producer Mitchell. Building from that confidence she established on Grace, One Place Live finds Cobbs inviting several guest vocalists, incorporating more personal songs of worship and extending her musicality, the latter with mixed results. Fortunately, One Place Live remains focused on Cobbs’ biggest ministry strengths. “Immediately” leans on the call and response of the background voices about praising God for everything He did and setting the tone in a very positive light. From the same composer who brought “Break Every Chain,” “Fill Me Up/Overflow” is further proof that Cobbs is extremely comfortable in soulfully transforming other worship leaders' material. The debut single, “Jesus Saves,” a song birthed from some personal issues, starts out in a peaceful manner before exploding into the worship abyss while always managing to uphold the song’s purpose. “I Love This Place” fixates on Cobbs' sweet vocal spot, where she humbles and cleanses herself in the sight of the Lord; thanking the Lord for His steadfast love when she was disobedient. While Cobbs’ connection with the Lord is never in question, One Place Live occasionnally drifts off course. “This is The Freedom,” a mid-tempo anthem of empowerment, is stagnant on all counts: vocally, lyrically and in the orchestrations. The same applies to “Put a Praise on It,” which offers little more than a six-minute plus re-flipped praise break, even in the exchanges with the usually reliable Kierra Sheard. Yet those oversights can be forgiven since the pros outlast the cons. Though Cobbs can absolutely hold her own without the aid of special guest talent, there are two particular selections on One Place Live where the co-lead vocalists are more than welcome assets. The precious harmonies of Murphy, Bishop Paul Morton and Pastor Bryan Pierce enhance the sheer beauty of “I’d Do It Again.” And “The Solid Rock” is an exceptional change of pace for Cobbs, as she joins fellow worship leader Jamie Grace in a pleasing acoustic canvas of country, urban gospel and a tinge of world music. 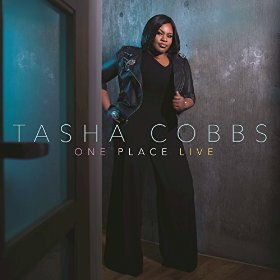 While there are a few stumbling blocks on One Place Live in comparison with Grace, Tasha Cobbs’ ministry experience with Pastor Murphy and her phenomenal intuition in connecting others to the Lord still resonates on most counts. It is an album that generally plays to the strengths of this very talented artist, and keeps us hoping that she’ll continue the delicate balance of praise and worship leader and recording/touring artist for many years to come. Recommended.